Spray 5-quart oval slow cooker with cooking spray. In medium bowl, mix corn, egg and cream cheese. Add muffin mix and 3/4 cup of the bacon; stir to combine. Pour into slow cooker. Cover; cook on Low heat setting 4 hours to 4 hours 30 minutes or until mixture is set and pulls away from side of cooker. Top with remaining 1/4 cup bacon. Let stand 5 minutes before serving. 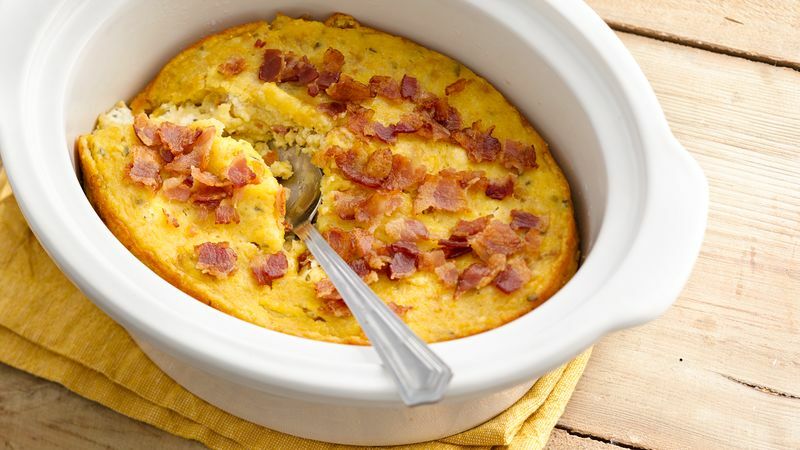 In addition to the bacon, chopped green onions and sour cream make great toppers for this easy pudding. While precooked bacon can definitely make this recipe even faster, a nicer thick-cut bacon will deliver quality you can taste!